The Monday we visited Weingut Stigler in the center of Ihringen, just next to Weingut Dr. Heger, was the last day of a long "Open Cellar" weekend of Weingut Stigler, for retailers, wholesalers, importers and restaurants. An immense number of wines was open for tasting. Andreas and Regina Stigler along with their son Max took care of their guests. We got a cellar tour with a Chinese importer from Andreas Stigler. Max Stigler showed us the wines. Regina Stigler offered us a delicious Gugelhupf cake. Weingut Stigler was founded in Ihringen in 1881. Today, it is run by the fourth generation of the founding family, Andreas and Regina Stigler. Their 12 hectares are situated primarily in the sites Ihringer Winklerberg, Freiburger Schlossberg, and Oberrotweiler Eichberg. From the 18th century to the end of the second world war, the Stiglers were also restaurateurs in the old post house as well as the large restaurant in the Freiburg train station. Andreas and Regina Stigler still share this passion and regularly offer culinary wine tastings with top chefs de cuisine. Careful winemaking brings forth wines full of character, with great aging potential. Pinot Noir is their most important varietal and accounts for 30% of their vines. It is strongly marked by the mineral-rich, stony soils, as are the red and white Pinots as well as typically for Stiglers, the Riesling. Weinkrake interviewed the Stiglers recently. Here is an excerpt of the interview. For the full interview go here. Before we start talking about your exposed locations with melodious names we should maybe define what types of wines you make exactly? Ihringen is a Burgundy domain. Yet you have the Riesling grape in your range as well. What is special about the Riesling from Kaiserstuhl? The Riesling is Stigler’s flagship and we will continue to hew to it in the future because the Riesling thrives excellently here. Of course there are bad years too as we unfortunately experienced in 2014. 2013 was a better year – we could save the grapes into the sweet sector. But 2015 is without a doubt a gigantic year for the Riesling. This lets us sustain the Riesling. What I want to emphasise though is that Kaiserstuhl – and especially Ihringen – is a region where you can find a big diversity of different types of grapes with a good ripeness. Thanks to you two, there is Chenin Blanc at Kaiserstuhl. Why did you decide on this grape variety? As far as I know we were the first to start cultivating the Chenin Blanc at Kaiserstuhl in 2003. Two years later we had the first yield which was still very frail. The decision for this type of grape is closely related to the climate change. And my husband is so fascinated by this grape! It offers a similar range like the Riesling. From the base to the Trockenbeerenauslese. Where do you want to class this wine among your portfolio? Unfortunately, these wines cannot become Großes Gewächs since they are not classified in the VDP. We will class our Chenin Blanc among the high-class Spätlese-dry-sector and also sweet and maybe cuvée sometime. The Ihringer Winklerberg stirs lots of wine fans’ blood. What is the secret of this location? It is a very exposed location in Baden. The Kaiserstuhl as a volcanic mountain range juts out. It is the only obstacle in the Rhine plain. The warm wind from Burgundy meets the mountains. An exceptional climate arises. The Winklerberg itself is occupies an area of 120 hectares.The frontal peak of the mountain consists of weathered volcanic rocks of voids. That is why tilage is only possible to a limited extent. The only thing we can do is to remove the rocks from the vineyard after winter. The bold Freiburger Schlossberg surely is a special challenge with its 70 degrees. What transports location and alignment into the wines? Just like at Winklerberg wines appear which possess freshness, elegance and profundity, albeit have different minerals since gneiss is dominating here and not the volcanic rocks. The wines from Winklerberg are daintier. The wines from Schlossberg are straight. Because of the bold location we have a marvelous sun exposure. Moreover the grapes are ventilated by a special down draught. The industrial canal at the foot of the mountain brings a good huminity. Concerning the design, the labels always show an excerpt of a vine in differing variations. What kind of concept is behind it? We wanted to bring the VDP ranking systematics on our labels. Grape and vine leaf have been a permanent feature of our cooperate designs for many years. We play with the idea that the higher the quality the more we zoom into the image of grape and vine leaf. In the base wine area you see both. Erste Lage shows only the big leaf and at the Grosses Gewächs label you see only the stern of the grape. We have different colours for the capsules, too. Red is for estate and local wines and gold for Erste Lage and Grosses Gewächs. There are two wines that have the names of your two sons. What do these two do in their lives? Our eldest son Max studies winegrowing in Geisenheim. In a few years he will enter the firm. The younger one studied pharmacy, studies business at the moment and will also work in the agricultural section later. Both are wine enthusiasts. And that is why the wines bear their names? It was a spontaneous idea really. Our eldest son has his own vineyard already. So the idea of naming a wine after him was not very far. It was a little more curious with the second one though. Actually the name of our second son is Frederik but at university they call him Fritz. We found that really funny and that is why we decided to name the other wine Fritz (laughs). Our dog’s name is Sissi. Maybe we up the ante. How about rosé? Thanks Andreas, Regina and Max for a wonderful afternoon. Dinner at Restaurant Schwarzer Adler (1 Star Michelin) in Oberbergen, Kaiserstuhl, Baden. The Vinum WeinGuide Deutschland 2018 was released on Friday, November 24, 2017. I participated in the presentation of the Vinum WeinGuide Deutschland 2018 in Mainz, Germany. The Vinum WeinGuide Deutschland 2018 is at the same time a new and an old German wine guide. 2 days after the publication of the Vinum WeinGuide Deutschland 2018, on Monday, November 27, the Gault Millau WeinGuide Deutschland 2018 was released. The Gault Millau WeinGuide 2018 was published by Zabert + Sandmann, which had aquired the license for the Gault Millau WeinGuide Deutschland in June 2017 from the Christian Verlag. The latter had published the Gault Millau WeinGuide Deutschland for many years. The Gault MillauWeinGuide Deutschland 2018 was put togather by a newly established team of tasters, all of them highly regarded, led by Editor-in-Chief Britta Wiegelmann. Previously, she was Editor-in-Chief of the Vinum Wine Journal. She took over the position from Joel B. Payne, who had been the Gault Millau WeinGuide Deutschland Editor-in-Chief (earlier with Armin Diel) since it was first published in 1994. Joel B. Payne - along with his Deputy Carsten S. Henn - stayed with the Christian Verlag, managed to bring on board the Vinum Journal and decided to continue publishing a wine guide under a new name: The Vinum WeinGuide Deutschland was borne. The Vinum WeinGuide Deutschland 2018 was put togather Joel B. Payne, Editor-in-Chief, and Carsten Henn, Deputy Editor-in-Chief, with the same team that put togather and rated the wines and winemakers of the Gault Millau WeinGuide Deutschland 2017, published 12 months ago. 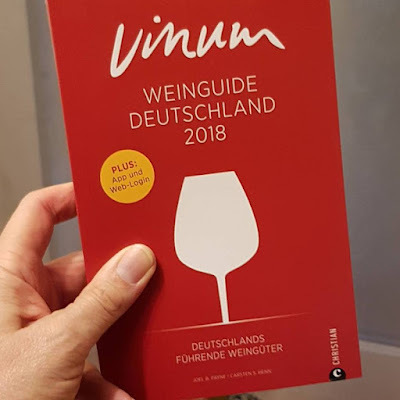 The Vinum WeinGuide Deutschland 2018 looks very much like the Gault Millau WeinGuide Deutschland 2017 except for the color of the cover, which is red and no longer green. Also, the winemakers do not receive 1 to 5 grapes anymore but 1 to 5 stars. Joel B. Payne made clear that he sees the Vinum WeinGuide Deutschland 2018 as an update of the Gault Millau WeinGuide Deutschland 2017 and in a row with the previous 24 issues of the Gault Millau WeinGuide Deutschland, the production of which he led as Editor-in-Chief. Red is now the new Green, said Joel B. Payne at the presentation of the Vinum Weinguide Deutschland 2018 (which is red), while the cover of the Gault Millau Millau WeinGuide Deutschland has been green during the past 24 years and continues to be green. The Vinum WeinGuide Deutschland 2018 reviews on about 1000 pages more than 12.000 wines of 1000 wineries. Its rating symbol is a star and Germany’s best winemakers are awarded one to five stars. The wines are rated on the 1 to 100 scale. The award ceremony started with a reception. This was followed by a presentation of the Vinum WeinGuide Deutschland 2018 Awards by Joel B. Payne. After the presentation, the winners poured their winning wines. Lunch was served and there was time to take pictures of the proud winners. The Vinum WeinGuide Deutschland 2018 honored outstanding personalities of the German wine world and special wines. After the presentation, the winners poured their winning wines. Lunch was served and there was time to take pictures of the proud winners.